Training programme on "Prevention of Suicide and Drug Addiction"
Sriperumbudur, Jan.09- One day Training programme on "Prevention of Suicide and Drug Addiction" for school children organised by Chief Educational Officer, Kancheepuram at Rajiv Gandhi National Institute of Youth Development (RGNIYD) held here today. 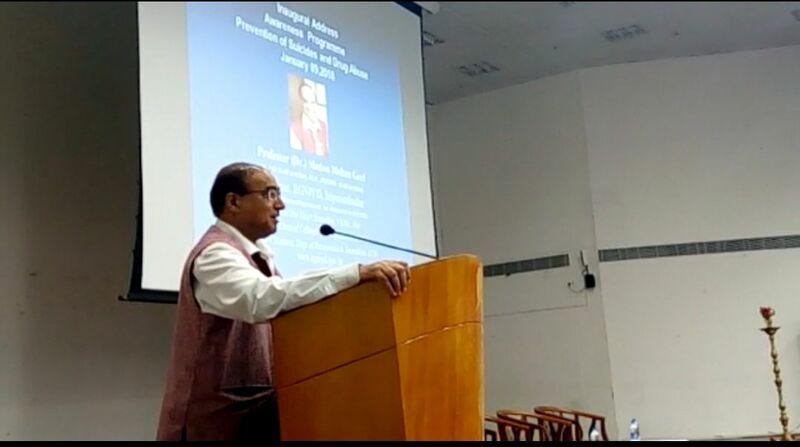 While delivering the inaugural address Professor Madan Mohan Goel, Director, RGNIYD diagnosed three major causes as peer pressure, adolescent immaturity and irresponsible parenting luring our children towards addiction and a life of suffering and leading to suicides also. To say no to suicides, we need to remember and understand the reality that soul is immortal and death rate is zero. As physical body everybody is to die and death rate is 100 percent than why fear which is false evidences appearing real, said Professor Goel. According to Professor Goel drug abuse is a serious public health problem that affects almost every community and family in some way. Drug abuse also plays a role in many major social problems, such as drugged driving, violence, stress, and child abuse. Drug abuse can lead to homelessness, crime, and missed work or problems with keeping a job. It harms unborn babies and destroys families. There are different types of treatment for drug abuse. But the best is to prevent drug abuse in the first place which is the objective of the training programme, believes the Director RGNIYD .